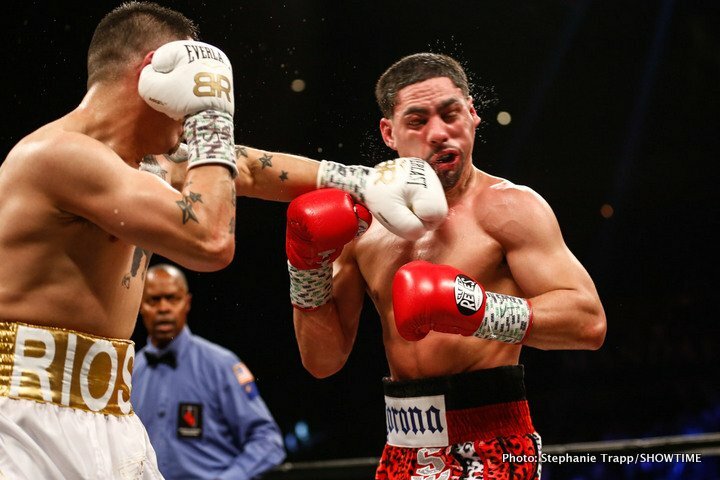 By Jeff Aranow: Danny Garcia (34-1, 20 KOs) says he’ll be ready to fight Errol ‘The Truth’ Spence Jr. (23-0, 20 KOs) in a unification fight and then move up to 154, as soon as he recaptures the WBC welterweight title in his fight against Shawn Porter (28-2-1, 17 KOs). Garcia and Porter still don’t have a date yet for their fight for the vacant WBC 147 lb. title, but the fight is expected to take place by the summer. Garcia states that his victory over Lucas Matthysse give years ago in 2013 means he’ll be able to beat Spence, because he’s being as heavily hyped now as Lucas was back then. Danny sounds like he really wants to fight the 28-year-old Spence. We’ll have to see if Garcia is whistling that same tune if he can get past Porter. It’s not a given that Garcia will be able to beat Porter, as he’s a much higher level fighter than Garcia’s last opponent Brandon Rios. Garcia doesn’t move well to elude pressure, and entire game seems to be based on his left hook and right hand. Porter could wind up mugging Garcia and making a mess out of him with his pressure in the same way Lamont Peterson did. Peterson still lost to Garcia, but it was close. Peterson isn’t the same kind of puncher that Porter is. Garcia, 30, emerged from an 11-month layoff last February to stop Brandon Rios in the 9th round in Las Vegas, Nevada. Garcia had been out of the ring since losing to WBA welterweight champion Keith ‘One Time’ Thurman by a 12 round unanimous decision last year on March 4 in a unification fight. Garcia was the WBC welterweight champion at the time, but he fell behind quickly in the first six rounds against Thurman. Although did rally to get back into the fight in the second half of the contest, he didn’t do quite enough to get the win. The judges scored the fight 116-112, 115-113 for Thurman and 115-113 for Garcia. “Sure, we’ll unify, and then there will be nothing else to do at 147,” Danny Garcia said to Fighthype about a unification fight between him and Errol Spence Jr. if he wins the vacant WBC welterweight title in his fight with Shawn Porter. ”I’ll go up to 154. After that, who else can I fight? That’s down the line now,” Garcia said about a rematch with Keith Thurman. “That’s not going to be in the near future obviously. Maybe in 2 or 3 years that might be,” Garcia said. Garcia says his rematch with Thurman will take place before it happens. Garcia doesn’t want to wait on Thurman. Garcia doesn’t know when or if Thurman will ever be able to fight again due to his elbow injury. If Garcia beats Spence and Porter, he wants to go up to 154. If the 5’8 ½” Garcia moved up to junior middleweight right now, he would have problems with the best fighters in that weight class. The top junior middleweights – Jarrett Hurd, Erislandy Lara and Jermell Charlo – are like middleweights in size, especially after they add water weight back in their systems when they make weight. The only good fighter out of that bunch is Thurman, and he was injured with an elbow problem in is fight with Garcia last year. “I win the [WBC] title and I fight Spence, then there’s nothing else I can do a 147,” Garcia said. ”I’m going to go up to 154. It’s going to be a good fight,” Garcia said about him and Spence. There are more fights that Garcia can take if he gets past Spence. There would still be Jeff Horn, Terence Crawford, Thurman, Manny Pacquiao and Lucas Matthysse. There are also the top light welterweights Adrien Broner, Jose Ramirez, Regis Prograis, Kiryl Relikh and Sergey Lipinets. Those would all be tough outs for Garcia. I’m not sure he could beat Prograis or Ramirez. Those guys are very good. Lipinets, Relikh and Ivan Baranchyk have heavy hands, and they would make it hard for Garcia to get past them. “I believe I can put anybody down. How is he a boogeyman,” Garcia said in questioning Spence’s ability. “He just won the title. He’s had 2 title fights. How is that the boogeyman? I fought the boogeyman before. Lucas Matthysse was the boogeyman. Look what happened to him,” Garcia said. Garcia is off base to compare his victory over the 5’6 1/2” Matthysse (39-4, 36 KOs) to what he would do against the 5’9 ½” Spence. He’s a lot taller than Matthysse, and he has a 3 inch reach advantage over the Argentinian fighter. Spence is an inch taller than the 5’8 ½” Garcia, and he has a 4” inch reach advantage. It’ll be a lot harder for Garcia to try and beat Spence than what he did against Matthysse. The two fighters are from different divisions. Matthysse has been a light welterweight through most of his career in compared to Spence, who has always fought at 147 since he turned pro in 2012. Spence is like a junior middleweight. He melts down from that weight class to fight at welterweight, and he always has a big size advantage over his opponents. He’s a much bigger fighter than Spence. Garcia used a lot of spoiling tactics to beat Matthysse in 2013. Garcia got away with hitting Matthysse with hard low blows in almost round of the fight. It wasn’t until the 2th round that referee tony Weeks finally took 1 point away from Garcia for his low blows. Garcia is right about a lot of the fighters in the 147 lb. weight class want to fight him. There’s money in fighting Garcia. But a lot of fighters like Spence want to fight Garcia also because they feel they can beat him, because he looks very vulnerable and he has been looking vulnerable for a long time. Fortunately for Garcia, he hasn’t always been fighting the good opposition. Garcia says he retired Thurman because of the elbow injury he suffered in their fight. In fact, Thurman says he came into the fight with Garcia already dealing with an elbow problem. The injury worsened during the fight because he was taking shots directly on the elbow when covering up. Thurman had successful surgery on his elbow shortly after the fight, and things were looking good recently. However, Thurman suffered a hand injury training for his now canceled May 19 fight, and now he’s dealing with that problem.